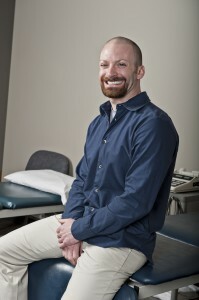 Home / Patient Info / Comeback Stories » Eric E, 31, of Lisle, IL, woke up one day in excruciating pain. Eric E, 31, of Lisle, IL, woke up one day in excruciating pain. Eric studied and trained in virtually every type of martial arts, body-building, rugby, wresting, yoga, as well as more traditional athletics such as football, basketball and track. Eric was particularly active and intense in his training in his adolescence and early 20s. Eric attended physical therapy, focused on his back for five months and treated pain from three herniated discs and a pinched sciatic nerve with epidural injections. Dr. Domb sent Eric for an MRI of both hips, which revealed labral tears and cam lesions in both hips and a fractured rim or acetabulum in the left hip. Eric then underwent hip arthroscopy by Dr. Domb to reshape him femoral head. Eric describes Dr. Domb as a truly good human being, who is professional, thorough and skilled at articulating process and procedure details in a way that is easy to understand. Over a year since his surgery, Eric continues to be satisfied with his results. He remains committed to getting even stronger and healthier. He says yoga, stretching and weight training are key to this continued improvement.